The sun is barely up as the team rises to begin their day. The cook is already stirring in the kitchen preparing the day's meals. One-by-one the team gathers at the table to enjoy the breakfast prepared for them. Then, with water bottles filled and teaching materials gathered, they head off down the dirt road toward the school, greeting passers-by with a cheerful ‘bonjou’. Up the hill, at the AEM Church and School, their students are arriving from various parts of the community, anxious to learn their next lesson in English. Our English Teaching Team has settled in to their new daily life in the village ofGensde Nantes, Haiti. In a recent update from the team, they gave us an inside look at their day. ‘After arriving at the school, our team began the teaching day in the chapel, where we prayed for our students and for God’s guidance on our teaching. We then headed to our three classrooms where we’ll teach in teams of two: Laurie & Julia, Heidy & Margo, and Meghan & Elaine. Russ helps out where needed in each of the classes. Today’s lesson was focused around weather, seasons and dates. We used flashcard pictures and vocabulary word strips to help the students visualize as they practice repeating the words and phrases in English. One exercise is to have all of the students tell us their birthdates and write it on a piece of paper with a picture of a birthday cake on it. They practice speaking the dates and numbers while matching the birthday to the person. The students have told our translator, Willie, that they are so happy to have us teach them, and that they would like us to stay for a month! At the end of our lessons, we gather together with our students in the chapel, which is always a special time. We sing and pray together both in English and in Kreyol. Today, Russ shared a personal story from his faith journey, translated by Willie. It was a steamy 38 degrees inside the chapel as we said good-bye to our students for the day. Heading back to the guesthouse, we stopped by the AEM Medical Clinic where EMCC Missionary, Marilyn McIlroy gave us a tour of the clinic buildings on the compound. 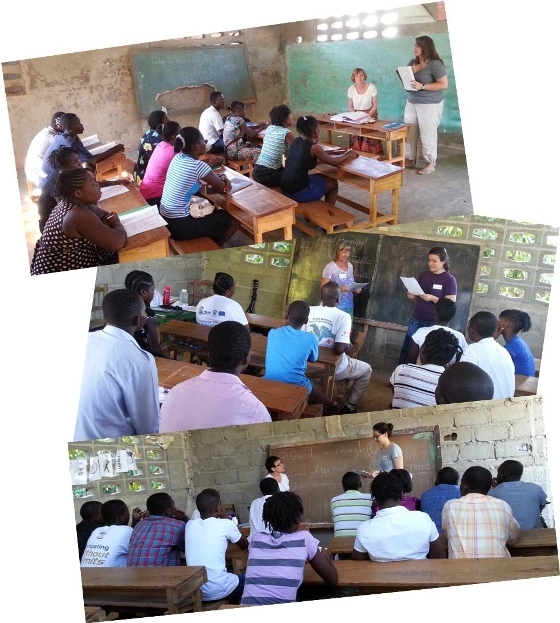 The English Teaching Team will be returning from Haiti on July 25/14. Follow their most current updates on our Facebook page and Twitter feed.